S.S. United States revived as a cruise ship? The prospective buyer, Crystal Cruises, has published a rendition (see above) of the ship as modified for cruising duty, The visible changes are minimal: a small extension of the superstructure aftward, and replacement of the long rows of old fashioned open lifeboats with short rows of modern high capacity enclosed inflatable life rafts. I'm delighted to see that Crystal intends to keep the original red, white, and blue funnel paint scheme. Greater change is in store below decks, where steam turbine engines would be replaced by diesels. 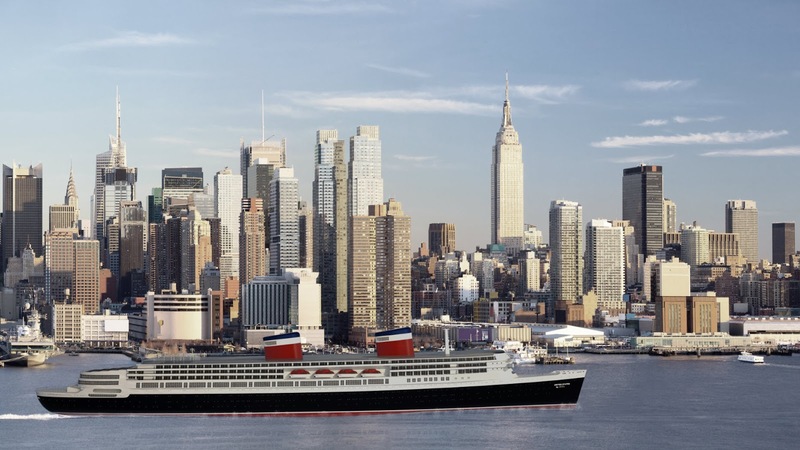 The thought of seeing the "Big U" once again heading into or out of New York Harbor -- Crystal's CEO says they intend to make New York her home port -- some day is thrilling. Still, there are a couple of troubling possibilities. The ship is contaminated with polychlorinated biphenyls (PCBs), carcinogenic substances that will have to be removed before the ship can be put into service. Crystal's CEO has said the cost of remediation, the extent of which will be determined after inspection by the EPA, could be a "dealbreaker". My guess is there's a good likelihood that Crystal will back out because of this. If so, the trip to the breakers seems inevitable, as any restoration of the ship as a public attraction would also require PCB remediation. Fortunately, an earlier owner who had contemplated using her as a hotel and casino had her cleaned of asbestos. Crystal is under the same ownership as the Norwegian Cruise Line. In fact, NCL bought the United States in 2003 from the last of a series of owners who had failed plans to use her for cruising or as a stationary hotel, casino, or the like. NCL eventually abandoned the plan to make her a cruiser, and, in 2011, sold her to the SS United States Conservancy, which has managed to raise funds sufficient to pay dockage fees and keep the ship stabilized since then. It's interesting to note that NCL previously bought another great transatlantic liner, S.S. France, and, with extensive modifications, converted her for cruising as S.S. Norway. As such, she served successfully from 1980 until 1984, when she was withdrawn from service to have her steam engines removed and replaced with diesels, along with further superstructure modifications, after which she returned to cruising until 2003, when a boiler explosion at the Port of Miami killed several crew members. She was then towed to Europe, laid up, and then sold for scrap in 2006. The whole story, ending with photos of her being dismantled off the beach at Alang, India, is here. Should the Big U become a cruiser, she would likely face a similar fate after twenty or so years of service, or possibly less. Interest in her preservation is likely to have faded considerably by then; there will be few left alive who can recall having sailed on her during her service as a liner, or have fond memories of the heyday of transatlantic sea travel. Her value as scrap is likely to exceed by a good margin whatever might be offered to preserve her. 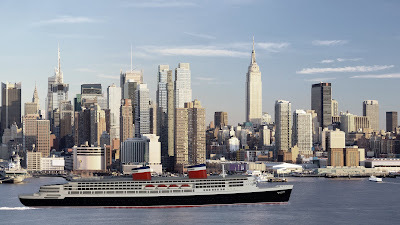 My hope was that she could be brought to New York, docked somewhere along what was once called "Ocean Liner Row" on Manhattan's West Side, and used as a floating hotel, much like her erstwhile companion Queen Mary in Long Beach, California. Ideally she would include a museum devoted to her history and that of transatlantic sea travel. Unfortunately, no one saw this as an economic proposition. Still, if some day I can look out across the harbor and see her, with her magnificent funnels, making her stately way to or from the sea, I will say a heartfelt "Thank you, Crystal."